Here is another filming update from our good friend Ryan. Today we get word that Sayid, Hurley, Kate and Aaron were filming at the “Smith Stop and Run” gas station. Hurley was not in a robe or a hospital gown so this scene probably takes place a day or so after the other scenes with Hurley and Sayid. However, we have no confirmation on which episode is being filmed, but Ryan thought it might be for Episode 5×02. The other key points are that Sayid is looking either “injured or tired” and that the gas price is listed at $3.22/gallon, which gives us a time frame of May 2007. So what is up with these 4 members of the Oceanic 6!? Sayid and Hurley flee a scene and Kate and Aaron show up!? Seems to be a bunch of running and chase scenes for many of the recent spoilers on and off island, so what do you think everyone is running from…!? Do you even care…or just want more isu on what is happening on island!? 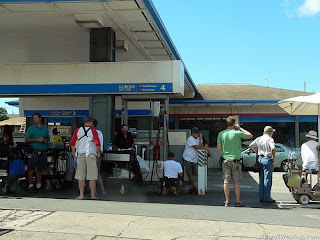 The “LOST” production crew returned to Kaimuki today, taking over the Chevron gas station at the corner of 11th and Harding avenues. It was renanamed “Smith Stop and Run,” and the price of regular unleaded was set to a tantalizing $3.22 a gallon. On the scene were Naveen Andrews and Jorge Garcia, Sayid looking badass in black, and Hurley in non-threatening pastel yellow. The pair flee the scene — Sayid looking tired or injured in the passenger seat — just as a silver Mercedes pulls in. It’s Evangeline Lilly, stylish as ever in a maroon, floral print top. And behind Kate, a very young blond boy in a car seat. Historical note: gas prices made headlines in May 2007 when they hit $3.22 a gallon, matching the record set in 1981 at the onset of the Iran-Iraq war.